This was not your storybook ending for Butler, who finished yet another season on the losing end, as the University of Connecticut’s men’s basketball team celebrated a NCAA Division I basketball championship in Houston, Texas on Monday with a 53-41 win over the Bulldogs. Butler, the team that truly represents the meaning of “student athletes” was forced to watch an elated Huskies bench celebrate a victory that clearly wasn’t too impressive. In fact, the Bulldogs contained the Huskies two stars, Kemba Walker and Jeremy Lamb, who finished the game with 28 points and 16 rebounds combined. Butler’s Matt Howard was extremely quiet and ended his final game with seven points, six rebounds and one steal, which may have not been what he had expected, but Shelvin Mack led the team with 13 points. The game began at an incredibly slow pace, as fans watched the heavily favored Huskies struggle to maintain momentum, but also, connect on their shots. The Bulldogs sloppy play held UConn to just 19 points during the first half, but once the final 20 minutes of regulation began, the Huskies executed their offense, flexed their muscles and tacked on an additional 34 points to secure the win. 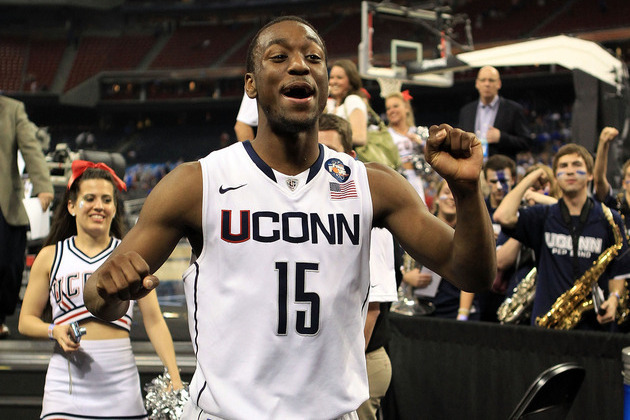 I’m going to ignore how bad the actual game was, and just say that UCONN is the National Champion.